Tara Lazar is an amazing woman with an amazing name that just sounds like the moniker of a children’s author. She is also a wonderful mother to two adorable daughters, a blogger extraordinaire, and a tireless advocate and promoter of picture book authors and illustrators. Her annual writing challenge, PiBoIdMo (Picture Book Idea Month)—hosted on her website each November since 2008—has inspired hundreds of folks to stretch their imaginations and brainstorm picture book ideas, some of which have been developed into manuscripts that went on to be published. Well, I’m thrilled to announce that Tara’s debut picture book—The Monstore—has just been released by Aladdin, and it’s a doozy! 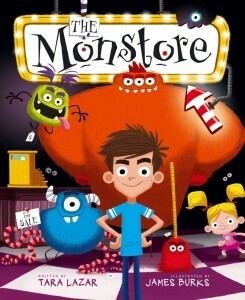 The Monstore is the kind of story that kids will want to read over and over again, and the delightful illustrations by James Burks ensure that parents will also enjoy repeated readings. Underneath a trap door at the back of Frankensweet’s Candy Shoppe is the Monstore, catering to all your monsterly needs. Zack is in need of a monster to scare off his pesky little sister, Gracie, who ignores the “Keep Out!” sign on his bedroom door. But the plan backfires, and unable to return his monster—the store policy is “No Returns, No Exchanges, No Exceptions”—Zack soon has a houseful of goofy-looking beasties who turn against him, teaming up with Gracie to frighten Zack. Ultimately Zack proves he can be a good older brother, but it’s Gracie who steals the story and comes up with a clever resolution. A great story coupled with brilliant illustrations adds up to a superb picture book that is sure to be a bedtime favorite. Check it out!